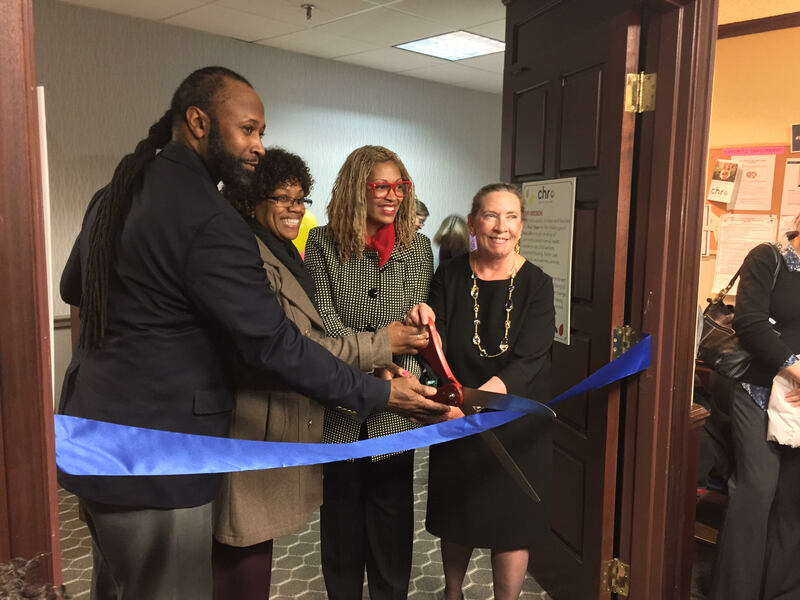 BLOOMFIELD, Conn. – Officials with CHR and Charter Oak Health Center today dedicated a new collaboration in Bloomfield that is providing complete care for people of all ages. As of this month, medical providers from Charter Oak Health Center are now seeing patients within CHR’s behavioral healthcare practice at 693 Bloomfield Avenue. Cutting the ribbon to dedicate the new services, from left to right: State Rep. Bobby Gibson; Bloomfield Mayor Suzette DeBeatham-Brown; Charter Oak Health Center President and CEO, Nichelle A. Mullins; and CHR President and CEO, Heather M. Gates. “Our goal is to provide a full range of healthcare services for the community,” said Heather M. Gates, President and CEO of CHR. “Bringing our expertise together under one roof will be convenient for the community and it will help to improve the overall quality of care through collaboration and coordination,” added Nichelle A. Mullins, President and CEO of Charter Oak Health Center. Services in Bloomfield now include a complete range of behavioral health services as well as primary and preventive care, screenings, wellness services, disease management, child and adolescent healthcare, women’s health services and alternative therapies including ear acupuncture. About CHR: CHR is Connecticut’s most comprehensive, non-profit behavioral healthcare agency, offering a broad array of services for adults, children and families whose lives have been touched by mental illness, substance use, trauma and more. Founded in 1966, CHR has a vibrant outpatient network of services as well as intensive and specialized services to address complicated needs, including residential and community-based programs. Learn more at www.chrhealth.org. To make an appointment, call 1-877-884-3571. About Charter Oak Health Center: Charter Oak Health Center, Inc. promotes healthier communities by providing quality, safe, patient-centered health care services in medically underserved areas, regardless of ability to pay. Since 1978, Charter Oak Health Center, Inc., a federally qualified, freestanding, Joint Commission-accredited, nonprofit community health center – has continuously provided community-based primary health care to residents in the greater Hartford area. Charter Oak Health Center has grown from a small organization operating out of an apartment building to the 60,000 square foot building patients now call their medical home. Learn more at www.thecharteroak.org. To make an appointment, call 860.550.7500.